*Data from Ontario were excluded because of data quality concerns. Excludes live births with unknown gestational age. Postterm birth rate is the number of births ≥ 42 weeks per 100 live births. Source: CICH graphic created using data adapted from Statistics Canada, Vital Statistics; Public Healthy Agency of Canada: Perinatal Health Indicators for Canada, 2013. http://publications.gc.ca/collections/collection_2014/aspc-phac/HP7-1-2013-eng.pdf -accessed August 31, 2017. 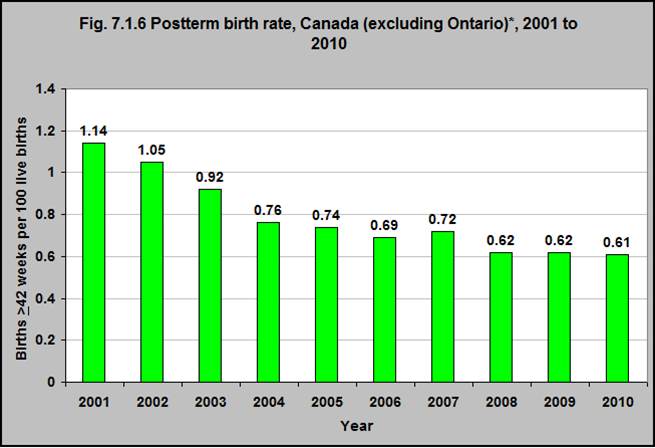 The postterm birth rate declined from 1.14 to 0.61 in Canada between 2001 and 2010. The declining rate of postterm birth may be related to the medical management of pregnancies that go beyond 41+ weeks. 1Galal M, Symonds I, Murray H, Petraglia F, Smith R. Postterm pregnancy. Facts, Views & Vision in ObGyn. 2012;4(3):175-187. http://pubmedcentralcanada.ca/pmcc/articles/PMC3991404/ -accessed August 31, 2017.